A reflex bow for instictive shooting and shooting from a horse. Ash wood is inseted by laminate to achieve opimum parameters. A centre of the bow is strengthen by an ash handle.The ends of shoulders are provided with shaped notches for anchorage of a bow-string.The bow-string is made of dakron fibres and it is provided with a firm wind to stop scratching. 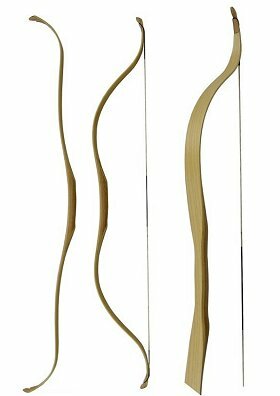 The bow called AVAR is inspired by bows of nomadic warriors who shot largely from a horse. The bow is suitable for instictive bow shooting. The bow is painted. Suitable for adults and youth.